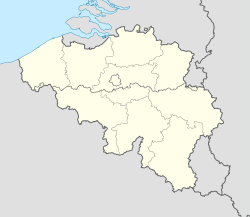 Tongeren (Dutch pronunciation: [ˈtɔŋərə(n)], French: Tongres, German: Tongern) is a ceety an municipality locatit in the Belgian province o Limburg, in the sootheastren corner o the Flemish region o Belgium. Tongeren is the auldest town in Belgium, as the anly Roman admeenistrative caipital within the kintra's borders. As a Roman ceety, it wis inhabitit bi the Tungri, an kent as Atuatuca Tungrorum, it wis the admeenistrative centre o the Civitas Tungrorum destrict. The ceety is a member o the Maist Auncient European Touns Network. ↑ MAETN (1999). "diktyo". classic-web.archive.org. Retrieved 19 May 2011.